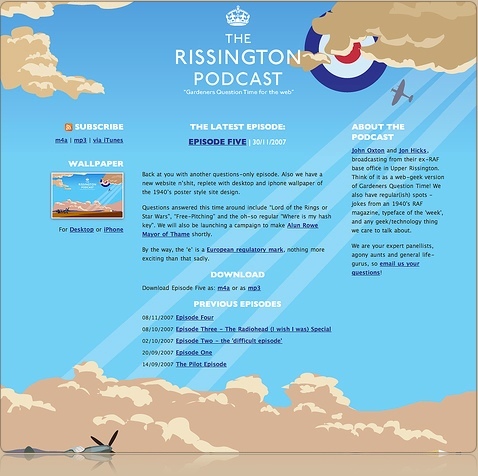 Jon Hicks redesigns Rissington Podcast website. My, what a few insane days it has been. 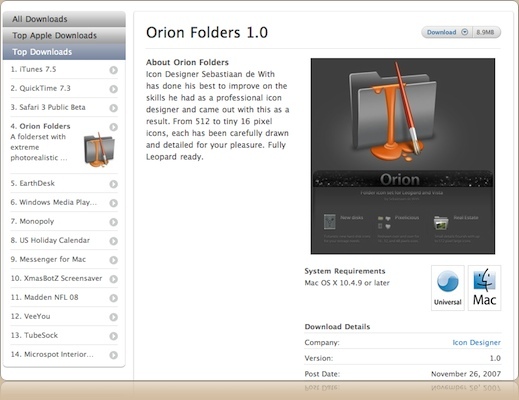 Orion hit the Apple website, while also being linked from other major sites like the Iconfactory. At the moment of writing, Orion just exceeded a grand total of 300 GB in downloads, with well over 150,000 new visitors on my websites. Actually, it’s the fourth most downloaded thing on Apple.com, just under iTunes, Quicktime, and Safari. I got a lot of email asking how to use the icons, and I gladly replied; Kupuk’s great tutorial of the ‘good ol’ manual way’, and Panic’s awesome Candybar 3. Of course, your downloads are flattening and the kind emails and comments have been very encouraging. 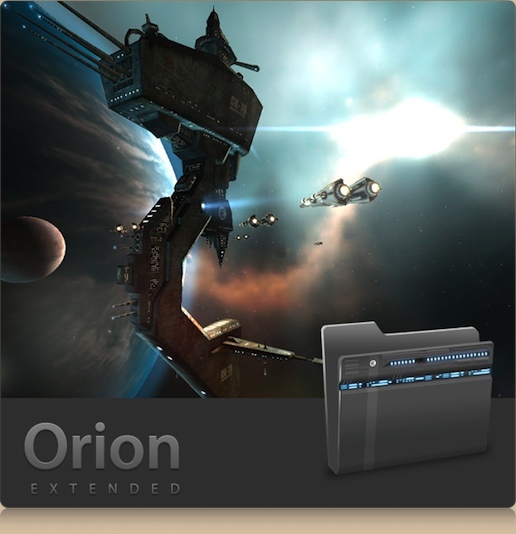 Work on the extended set of Orion, with all system replacements for Mac, Windows, and Linux, along with several creative new folder motifs, has commenced already. I will push out a new volume with a complete system replacement icons, and a dock for OS X, late in December or in January. What’s that? A sneak peek? Okay, one of the ‘fantasy’ microsets in the extended Orion is… a ‘sci-fi’ themed, highly detailed EVE Online architecture set. Permission from CCP Games pending. What is most important in all of this, is your feedback. You want more folders? What kind of folders? Your vote counts! As the cumulative comments of this blog are reaching 500 fast, there is chance that your comment will be the 500th – which means prizes, baby! Drop your requests in this post’s comments and have a fair chance of winning a full license for Noble, my stock icon set, and a single folder icon request for the upcoming extended Orion iconset that will be fulfilled – guaranteed!. Of course, comments on all posts are eligible – be sure to use your actual email address. But what do you have to hide? Excellent movie I had already seen, but I figured I wanted to share with people who feel less strongly about this. The buzz about Mac-websites being hacked (which didn’t even amount to that much buzz after all) was just yet another staged event by MacHeist. Honestly, I’ve never participated in MacHeist, as their ‘mission to support indie developers’ seems a bit off; it amounts to selling ‘promo bundles’ of which most of the revenue goes to the MH guys themselves. I find hype-machines fun if the end product doens’t turn out to be hot air, and if it actually supports people I like. Gus has pointed it out before, but this really put the nail in the coffin for me. MacHeist is absolutely dead to me. That really left me with a very foul taste in my mouth. The websites that were ‘hacked’ weren’t in my feed-reader, and I now know why. Just to remind myself of the power in our hands and the threads on which this world of ours hangs, I’m going to hang up a print of this in my office tomorrow. Efficient power. Incredible physics. 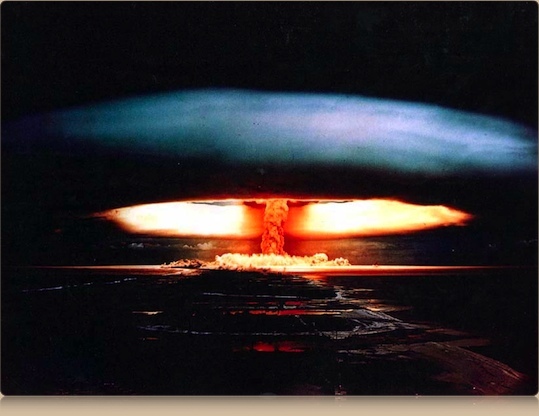 And a press of the button could make this happen. Candybar 3.0 released with Dock support and much more. The revamped icon manager, now the old Pixadex and Candybar-in-one! I helped Cabel and the Panic dudes test this a bit, and it’s truly beyond what I could have imagined in an icon application. It’s simply a must. Expect a new mystery freeware set in December with a custom dock to make full use of this gorgeous app! You can download the trial and explore its features over at Panic.